I bought this from Walmart this week.. it was soooo cute! I couldn't resist!! So, do these have any "special needs" or is it gonna be ok with my deadly black thumbs? I reject your reality, and substitue my own! My favorite digital camera photos that I took. My family, garden, and a bunch of misc. photos! Sorry I can't answer your question, Meg. Just wanted to tell you those are beautiful. It would have been hard for me to resist them, too! They like moist, humus rich soil and partial shade but will tolerate full sun in cooler zones. The leaves will go dormant if it gets dry in the heat of the summer. I just divided mine and replanted 4 clumps into a couple of my hosta beds, so that the hostas will fill in the space when they go dormant. I planted a fifth clump at the front of my house in full sun as an experiment. I have a bleeding heart in my garden. In the winter they die off and it looks like its dead and it has dry twigs, but don't pull it up, it will grow back beautifully, just like your picture. Speaking of bleeding hearts I planted a bareroot recently and I've been waiting for some sign of it, but theres no change. Did I do something wrong or does it always take this long to come up? I planted a bareroot last year and it took a little while for it to come up. I had to make sure that I kept that area watered well. It didn't grow much last year, but this year, it is looking pretty good. 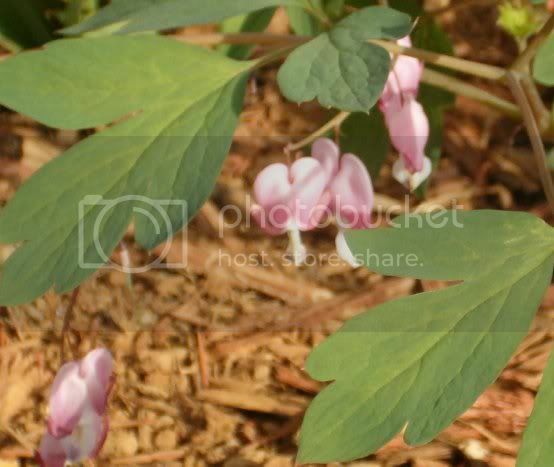 I love bleeding hearts.My friend has some growing in her shade garden.They only bloom for about 3 weeks, but they are so beautiful. 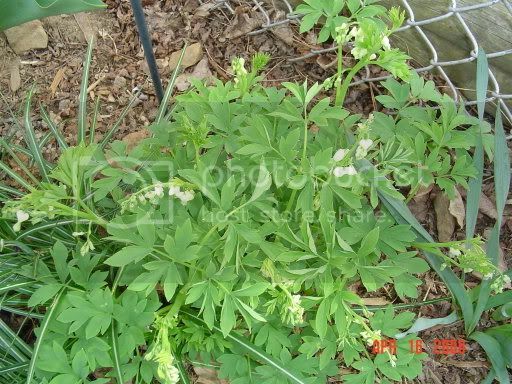 3 years ago I planted fern-leafed bleeding hearts in my garden.The plants are much smaller,with fern-like foliage.But they bloom all summer and are really pretty. I have 2 traditional, and 3 'dwarf bleeding hearts' which I purchased from springhill. Although I love them all, I have to say that the dwarf are AMAZING, as they flower from early summer untill the first hard frost. The foliage will stay healthy and green as well, even with the brutal summers here in Delaware. You might want to consider picking up a few! i have the ole fashioned red bleeding heart and the Fernleafed bleeding heart.. It came with my house when i bought it.. fernlead..I just recently found out what it was .. catalog .. It stays short and smaller hearts.. I will send photos after them bloom<, They are headed up real well right now.. Love the cold climate. They are hot weather or sun lovers.. One is on the north side , the othe on west side with half a day of sun. I tried them once I wasn't successful so I haven't tried them again. They are doing great now ready to go to anyone else.. Here's mine....it's just starting to bleed! I love it! I want a few more actually! You cheat.......Mine is only 5 inches tall .. You have white..?? Would you want to swap for some red> ? One like yours red and Fernleaf bleeding heart. You can have either or both..
Duckie - Love my fern leaf too. I can't believe how long the thing bloomed last year. Absolutely beautiful plant. mine get about 2 foot and 2 foot wide. 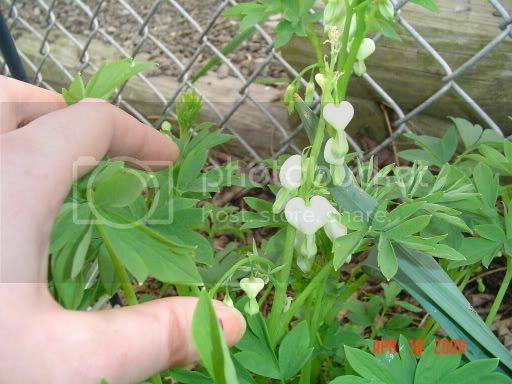 I have the smaller Fernleaf bleeding heart that is short and sweet. I love bleeding hearts. They are so cute. I had two and they didn't make it last summer (even in serious shade). Too hot for them. ps. 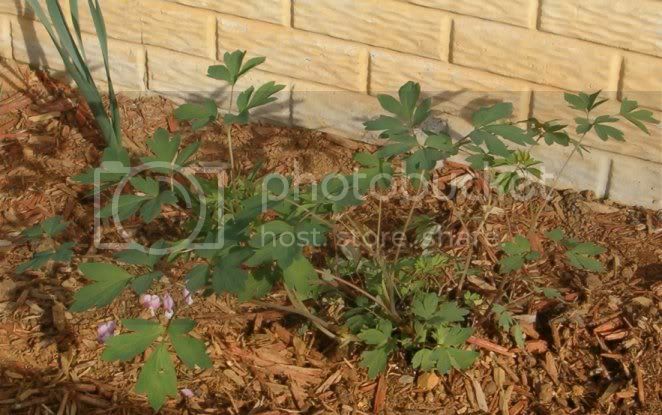 If you are talking about plant exchange, how exactly do you do that without the plant dying? Inquiring minds want to know. (overnight UPS)? Are there any plant shipping regulations to worry about? I USE REGULAR POSTAGE.. CLEAR TO CALIFORNIA AND THEY GET THERE FINE.. nO REGULATION THAT I KNOW. I HAVE NO PROBLEMS. GETS TO CALIFORNIA IN 3 DAYS, FROM PENNSYLVANIA.